Easy chicken marinade that uses a mix of pantry staples and fresh ingredients. A combination of olive oil, lemon juice, mustard, parsley, and garlic makes each bite burst with of flavor. Chicken is almost always on the menu at our house. Although I admit, it can get a little repetitive and boring eating the same thing on a regular basis. Applying a chicken marinade is a tasty solution! Not only does the protein infuse and deliver more flavor, but the right marinade also makes it more tender and juicy. A win, win! Whisking together a combination of savory, aromatic, and tangy ingredients is a game changer for chicken. This marinade recipe is a light honey mustard base, a classic pairing for poultry. All you need is under 60 minutes of marination time for the flavors to transfer before it gets cooked. This mixture ensures that the chicken is brined to make it juicier and tender. A harmonious blend of flavors is delivered to the surface. 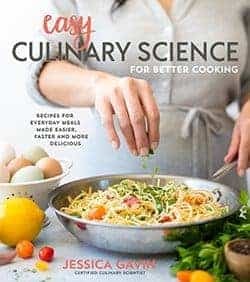 You can also use alcohol to provide stronger flavors because it acts as a solvent and can move to the interior of more efficiently. An excellent example of how I apply this is in my tequila lime chicken recipe. It’s no secret; chicken often falls victim to becoming dry and overcooked. This is especially true with grilled chicken due to the high direct heat. It also can be bland and uninteresting. However, a chicken marinade can save the day! Salt acts as a brine, helping the chicken hold more water and become more juicy, easier to eat and become more savory in flavor. Garlic and soy sauce is high in glutamates, which gives an umami flavor. Garlic also has unique flavor compounds that can infuse into and coat the exterior of the chicken. A little bit of honey balances the lemon juice but also encourages quicker browning through the Maillard reaction and caramelization. This process encourages more color and flavor development. For this chicken marinade recipe which contains lemon juice (an acid), marinate for at least 30 minutes, but no longer than 1 hour. Too much acid makes the surface mushy and dry. It can also turn the chicken white and give a cooked appearance. Cooking the protein with acid is something you want in ceviche, but not chicken. Another alternative is to marinate for 24 hours max, not adding in the lemon juice until the last 30 to 60 minutes of marination before cooking. This process can prevent the undesirable texture development mentioned above. For this chicken marinade recipe, I used chicken breasts. They seem to benefit the most because the meat is so lean and neutral. The marinade helps it stay juicy once cooked and add a layer of extra flavor to each serving. Any cut like thigh, drumsticks and even wings can benefit from this honey mustard marinade. Experiment with different ingredients to create exciting flavor combinations! Just make sure to keep the essential ingredients categories in mind. Acids like vinegar, lemon juice, and buttermilk are commonly used in marinades. Note that too much can cause the marinade to be overly acidic, reducing the chicken’s natural pH. The muscle proteins over time will pack together, squeezing out the moisture. To prevent this, use a small amount of the acidic ingredient, no more than 25% of the marinade recipe. Also marinate for a shorter period, 30 to 60 minutes. 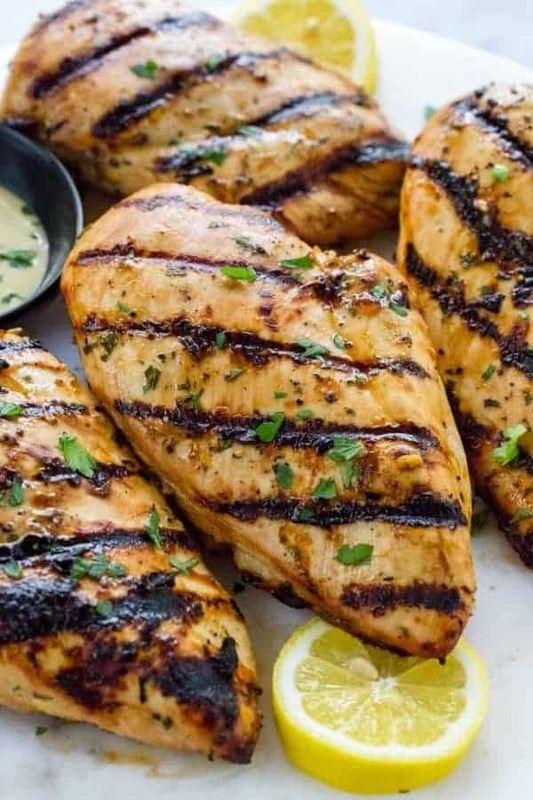 Easy chicken marinade that uses a combination of olive oil, lemon juice, mustard, parsley, and garlic to make each bite burst with of flavor. In a medium-sized bowl whisk together olive oil, water, lemon juice, mustard, soy sauce, honey, salt, garlic, parsley, black pepper, and lemon zest. Add chicken to a baking dish or large resealable plastic bag. Pour marinade over the chicken, cover and refrigerate. Press out the excess air if using a Ziploc bag. Marinate the chicken for a minimum of 30 minutes, up to 60 minutes maximum time. Flip chicken over and every 15 minutes for even marination. Remove chicken from the marinade and pat dry with paper towels to remove excess moisture from the surface. Cook chicken using the desired cooking method, such as grill, bake or saute. Transfer chicken to a cutting board and tent with foil for 10 minutes before slicing. Serve chicken with lemon wedges. The recipe makes about 1 cup of marinade which is good for up to 2 pounds of chicken. Increase recipe size as needed. Chicken breasts, thighs, quarters, wings, legs and bone in pieces can be used for this chicken marinade recipe. Chicken can be marinated overnight by waiting to add the lemon juice until the last 30 minutes to 1 hour of marination time. Grill: Preheat grill over high heat (400 to 450ºF / 204 to 232ºC). Carefully grease the cooking grates with the oil. Keep one burner off for indirect heat cooking. Place the chicken on the direct heat side of the grill and close the lid. Cook each side for about 5 to 8 minutes, depending on the thickness and type of chicken. Move the chicken over to the indirect heat side of the grill and finish cooking covered, until the recommended internal temperature is reached and chicken is fully cooked. Saute: Heat a large cast iron or stainless steel pan over medium-high heat. Once hot, add 1 tablespoon of oil and allow to heat. Saute one side for 4 to 5 minutes. Thurn heat to medium and flip over. Cook until fully cooked, about 4 to 6 minutes. Bake: Preheat oven to 450°F. Add chicken to a greased foil-lined sheet pan or baking dish. Bake until fully cooked, about 15 to 20 minutes, depending on the thickness and type of chicken. MAKE IT PALEO: Use maple syrup instead of honey. I usually have low sodium soy sauce on hand, so would you adjust the salt in this marinade recipe? Thank you for all the wonderful information you provide. 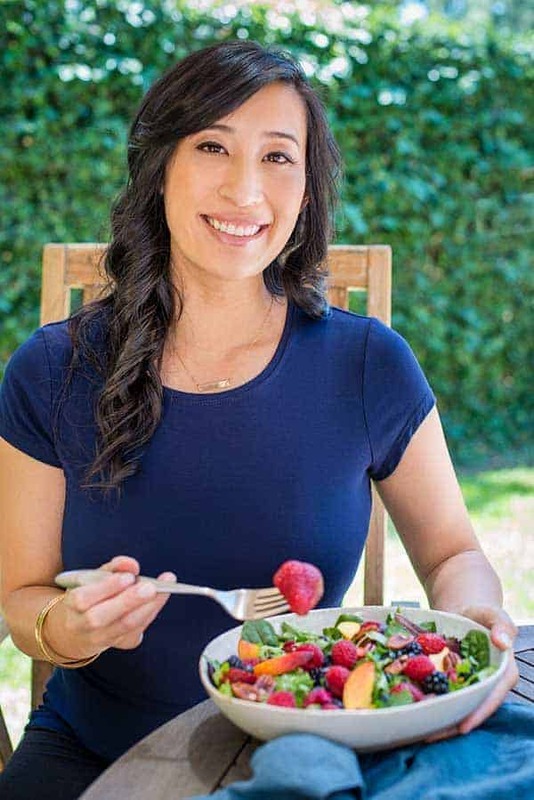 Hi Janet- Low sodium soy sauce has about 37% less sodium. You can add 4 teaspoons of soy sauce total to get closer to the salt amount, or leave as is since there is already additional salt in the marinade. Let me know how it turns out! How would you approach sous vide chicken breast with marinade? Hi Dennis- I think I would still marinade the bulk chicken for 30 minutes, pat dry and then transfer to the bag that you are planning to sous vide in. Then cook according to your recipe. Let me know how it turns out! I’ve been using this marinade constantly this summer! Makes perfect chicken to throw on top of all your salad recipes. Yum! Thanks for your feedback Helen. It’s sort of a brine/marinade, so the salt is higher than traditional recipes. However, it certainly can be reduced to your desired level. Did you happen to dry the surface of the marinated meat before cooking? That could help reduce some of the salt flavor. I just made this tonight and it turned out great. I added some ginger powder for a little pop. Thanks for the recipe! I made this tonight and it was delicious. I didn’t feel like messing with the charcoal and I don’t own a gas grill so I did the saute method. Very good and very easy. I tried this tonight and it was delicious! Marinated for one hour and it was amazingly moist and tender. It was a bit salty though, so I will adjust the salt to perhaps half or else double the soy sauce instead. What would you recommend? I was looking for a marinade to try out for a dinner party with friends this weekend and I’m happy I found it! Thank you for your feedback Jan! Did you pat dry the chicken before it was cooked to remove the marinade? You can reduce the salt if you’d like to 1-2 teaspoons to reduce the saltiness. I’m so happy that you found my recipe as well! No, I did not pat dry, but I think I will reduce the salt amount, because I like the flavor that the soy sauce (combined with all the other ingredients) provides! I tried this today and boy was that some good chicken! The chicken came out juicy and flavorful. I doubled the recipe for 3 large bone in breasts. Marinaded for 1 hour and turning every 15 minutes as stated. I also didn’t pat dry the chicken before putting it on the grill. Amazing taste! This will be our go to marinade, thanks so much Jessica! Thank you for your feedback Mondo, great comment! I don’t consider myself to be much of a cook, but I made this for my (grown) kids this evening, and it turned out perfectly. I used low sodium soy sauce but all of the recommended kosher salt, and wiped the chicken before cooking. Cooking to 160 and then observing the resting time meant that the chicken was perfectly cooked. I will make this again! Thank you for your feedback Ann, so happy to hear that it turned out well! I baked the chicken and served it with saffron rice…delish! This will definitely be my go to marinade recipe. Yay! That sounds like an amazing combination Mary Jo. Want to try this but don’t have soy sauce what should I do? Hi Evelyn- You can leave it out. Or you can add tamari, coconut aminos, or some Worcestershire sauce. Can this be frozen along with the marinade for later use? Yes, you can freeze the chicken with the marinade. So awesome! Entire family loved it! FYI, I did not have Dijon, so I substituted with Stone Ground Mustard, it gave it a nice texture and flavor. I also ran out of soy sauce so I used coconut amino. It came out fantastic. Thank you for posting the recipe. It’s a keeper for sure!